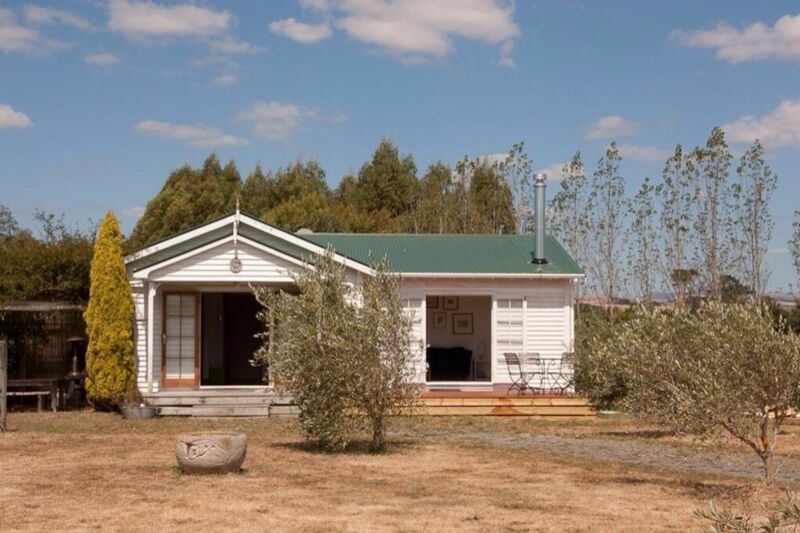 The Wine Box is a lovely character cottage on a one hectare site on the edge of the Martinborough township. Set in amongst 200 olive trees there is plenty of outdoor space. The wood fired pizza oven, outdoor fireplace and gas BBQ provide an outstanding outdoor living environment. Inside there is a master bedroom with ensuite and french doors opening out to the olive grove, a second bedroom with a queen bed and the third bedroom has room for four singles - one set of bunks and a single with a roll out divan. The main bathroom has an antique claw foot bath with shower. A kitchen (with espresso machine) looks after all cooking requirements if you chose to dine at the house. Please note that there is only a bar fridge as there is not room for a full size one. The lounge has a wood burner - THIS DOES NOT HAVE A FIRE GUARD SO SMALL CHILDREN NEED TO BE SUPERVISED DURING WINTER MONTHS. With a 10 minute stroll to the square, all the features of Martinborough are available to you. There is no smoking indoors, and pets are welcome but must stay off beds and furniture. Rentals are minimum 2 nights stay for standard bookings, but 3 nights stay for special weekends (eg, Fairs / concert weekends / long weekends). Minimum rate is for two people using one bed. Additional beds are at the additional people rate. Check in is 4pm, Check out is 12nn unless otherwise requested. Wood burner and two oil heaters. There is a la pavoni coffee machine with coffee grinder. A great cottage for a small group or family, with plenty of room and some nice touches such as a coffee machine, throws and SKY TV. The location is quiet and peaceful yet only a 5 minute drive to town. It was quite cold when we stayed so we lit the wood stove and used the electric blankets and we were soon warm. The owner was quick to respond to any questions and had left useful info on walks and activities. We would love to come back in the summer with friends. We stayed at The Wine Box for 3 nights and absolutely loved our stay. The house is perfect for a relaxing getaway with everything you require. Close to the village- we actually used the bikes on site to cycle to and from everything which was great. So peaceful. Lovely section filled with olive groves and nice outdoor area. The pizza oven was a bonus. Only thing I would comment was that the place does need a bit of a clean. The place was nice and sweet and the position in the olive groves was lovely. In a good location as well. However, the house was full of mice and unfortunately, there was a lot of mice poo on the beds and sofas - new stuff left during our stay. I have notified the owner and they are trying to make improvements. Great location to stay with a pet, plenty of room for all and close to all the amenities of Martinborough. Property was clean and tidy and honestly represented in the advertising. Would definitely stay again and recommend to others. A strange review to write as I didn’t actually stay the night due to a family emergency however the rest of our party did and enjoyed themselves. The Wine Box is a lovely character bungalow with wooden features and stained glass windows. It has been thoughtfully decorated to ensure your stay is comfortable and fun. From what I saw the outdoor areas could be really spectacular however the furniture is a little tired and could do with fixing or replacing. Also, I don’t think you could use the outdoor pizza oven due to the cooking tiles being cracked and loose but I don’t actually know if that’s even a featured option?? The members of our party who stayed said the cleaner arrived at 3:45pm (for a 4pm checkin) and left the dishwasher full. No biggie but maybe an earlier time for cleaning would result in a better experience. All in all, I loved the look and location of this property and would book again. (These observations are purely for the owner to take note and do not really impact on your stay) I hope I get to book again sometime soon! Lovely little cottage in a quiet serene location. Basic but lovely, has everything you will need. Clean, homely, just a really nice stay.